Here’s how to practice your American Pronunciation – imagine that you take some water in your mouth, then start watching my video and repeat every sentence after me! Here’s the sounds you have to FOCUS on: R sound, flap T sound, W sound, ‘Ash’ sound, dark L sound – the more you practice, the better you’ll get at it! 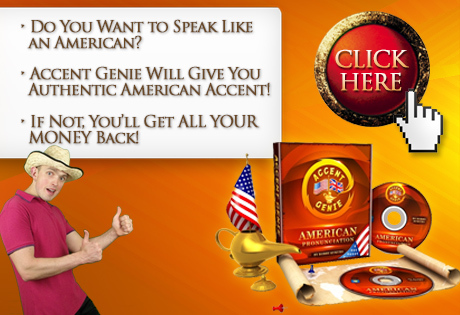 Hi guys, it’s Robby here from AccentAdventure.com where we learn to sound like American English speakers, right? But in case you don’t really aspire to sound like an American English speaker, if your goal is just to improve your pronunciation enough to sound decent while communicating with other people in English, you still may want to check out the blog, AccentAdventure.com right here! Just click on this link and it’s going to take you to my blog where you’ll find dozens upon dozens of very relevant articles and videos and it’s all about pronunciation improvement. It’s not necessarily how to sound like a British English speaker or an American English speaker but it’s going to improve your accent big time, even if you don’t aspire to sound like a person coming from a specific geographic area. But anyway, the whole thing it’s geared more towards the American pronunciation and that’s what I’m probably more passionate about myself personally and that’s the road I’m taking anyway. And in today’s video we’re going to look at much the dreaded English sound, TH, right? TH sound which is the “the”, the voiced version of it, right? TH like in the word “the,” right? “The” and the unvoiced version TH like in the word “thumb”, all right? Biggest Mistake Made by Foreigners – OVERDOING the TH Sound! And this is what a lot of foreigners get wrong when they’re trying to use this sound or to pronounce this sound when they speak, right? They try to get it like in a book, right? They tell you that you have to pronounce it this way – you have to place your tongue between your teeth like that. This and these, that and those, this is how the TH goes, right? There’s a saying like that. And you guys are probably trying to get it just like in the book when you speak and that’s when you start running into an awful lot of problems. Because in reality the TH voiced sound TH becomes more like D. It’s something like the D sound, right? It’s just that it’s not really a stressed D. Nobody really says “Dis”, right? Although there are certain native English speakers who say that, who speak that way when they come from specific geographical areas. But anyway, that’s beyond our discussion today. Don’t Place Your Tongue BETWEEN the Teeth – It’s WRONG! Suffice it to say that, you just have to place the tip of your tongue behind your teeth. TH. TH. Like that. TH. This. This. This. It’s this. It’s this. Nobody really says “it’s this.” People say “it’s this”. It’s the 100th video on my YouTube channel. It’s the 100th video. Nobody really says “it’s the 100th video.” It’s the 100th. And speaking of the unvoiced version, the TH, the TH sound as in the word thumb, it becomes T. It’s more like T. 100th. For the 100th time. It’s my thumb. Thumb, right? Obviously it’s not the very same as T. It’s not my tumb. It’s thumb. It’s something between the thumb and tumb, right? Thumb. Thumb. Thumb. Thumb. But it’s more closer to the T sound, right? So you’ve got to be imagining that you’re actually pronouncing the word tumb instead of thumb to get it right. And why I said that a lot of foreigners run into problems when they’re trying to nail this sound and make it sound textbook like? The reason being, they get it completely wrong. They go overboard, okay? And in relation to this I want you to check out this particular article called “Don’t overdo your English pronunciation” – click right here. It’s going to take you to my blog where you’re going to read the article, right? And it’s all about trying to get the pronunciation a 100% correctly and that that’s when you’re starting developing these issues. A Lot of Eastern Europeans Get the TH Sound Completely Wrong – Because They’re Overdoing It! And the here’s the typical example. A lot of Eastern Europeans such as Latvians which is what I represent, I’m a Latvian myself and Russians most notably probably pronounce the voiced TH sound as Z. Zis is. Instead of saying simply this is, right? It’d be way easier for those folks just to say “dis is”, right? They would just have to imagine that the word this is spelled the following way D-I-S, right? Dis is. But they’re obviously being taught wrong by their teachers at school, right? So teachers probably demanded that they get the sound a 100% correctly, just like it says in the textbook by their tongues placed between their teeth. This is. This. And obviously a lot of those people don’t get it. They just can’t for some reason or another and then eventually they end up with saying “zis is”. Zis is. Because when you’re placing your tongue – I was going to say your thumb – your tongue between your teeth and then when you pull it back ever so slightly it becomes Z. Z. Z. So a lot of those Russians or Latvians or Ukrainians, you name it, you pick any Eastern European country you want, a lot of them say “zis”. Instead of just saying “dis” which is way easier, right? So that’s what I warmly suggest you do guys if you’re one of those people who can’t get it right, who can’t say “this” between your tongue placed between your teeth, you’ve got to imagine that you’re actually saying the letter D or T in case it’s the unvoiced TH sound, right? And just like I said actually no real native English speaker speaks like that in real life. Nobody says “this is”. Especially in fast speech people say “dis is”. “Dis”. So the TH actually does become more like “dis” and not so much as “this”. All right? And going back to the question which is the reason why I’m actually creating this video in the first place, one of my subscribers asks me a question if I can make a video on how pronounce the TH sound after “S” like “close the door”. Close the door. Well, it’s pretty much the same. You’ve got to imagine that TH is actually D. So instead of saying “close THe door” which is very confusing if you’re trying to get it fast, you really can’t. It’s very difficult to say “close THe door” Close THe door, right? So forget about placing your tongue between your teeth, just say “Close de door”. Close de door. And it’s going to be just fine. That’s how native English speakers speak all over the world. And the other question he asks is how to pronounce S after the TH sound, like “clothes”, right? C-L-O-T-H-E-S. Nobody really says “clothes”. It’s totally wrong. And actually that’s what the dictionary tells you to – that’s how the dictionary tells you to pronounce this word. The phonetic transcription actually has included the symbol for the voiced TH sound. So you’d be thinking that you’ve got to be pronouncing the “THe” thus making the pronunciation as “cloTHes”, right? But that’s wrong. People just say “close”. It’s as if you’re saying “close the door”, right? So again, just forget about the TH and imagine you’re just saying “close”. Put the clothes on and close the door, right? It’s pretty much the same pronunciation my friends. In this relation I want you to read the following article “The importance of speaking out loud when learning new English vocabulary words”. Click on it. Read it. And it’s the other blog that I have EnglishHarmony.com. And well, in this case I can’t actually link to this article straight from this video because I’m only allowed by YouTube to link to my Accent Adventure blog. So you’re going have to enter this URL in the URL bar above in your Internet browser. But anyway, it’s worth reading. And it’s all about the importance of learning new vocabulary by speaking it out loud. And obviously you can’t just rely on the dictionary, phonetic descriptions and whatnot because they’re oftentimes wrong. You’ve got to actually listen how words are pronounced in real life by real people, right? And there’s no better way of getting that right than checking out the Accent Genie program which is a product I created myself! There’s hundreds upon hundreds of American English phrases and sentences which you will be repeating thus imprinting all those sound patterns into your brain and into your mouth, most importantly, which is going to enable you to speak like an American English speaker. And just like I said in the beginning of this video it’s not just about speaking like an American speaker, you’ve got to be just speaking very well. Your pronunciation is going to improve big time. All right my friends. I hope that this shed some light on how to pronounce the TH sound. And if you have any questions please publish them in the comment section below. Thanks for watching and bye-bye! Very interesting, but also a bit confusing at least for me. I think it’s a bit confusing because I have practiced quite a lot in the past in order to get the TH-sound just like it is in the textbooks and now you say that it’s wrong. If I understood correctly, the real TH sounds are something between the textbook TH and t and d, respectively. Right? As I said, I have tried to make it exactly like the textbook TH, but my pronunciation still tends to fluctuate between the textbook th and t and that’s why I may have sometimes gotten it accidentally just right. This whole TH controversy is something new for me. I already knew that it is much better to say dis instead of zis if you don’t manage to get the actual TH-sound in the word “this” right, but it’s completely new that the real TH shouldn’t be pronounced as the textbook TH, but something between. I think you’re spot on in saying that we’ve got to listen more carefully how words are pronounced in real life by native English speakers. Nice to see another one of your comments, thanks so much! Yes, I totally understand your confusion about the TH sound, so I’ll elaborate on it a little bit. “If I understood correctly, the real TH sounds are something between the textbook TH and t and d, respectively. Right?” – exactly! What the native English speaking teachers don’t realize (you may wonder “How can they not realize that if it’s so obvious” – well, again – human nature! Everyone in the industry is so indoctrinated that they don’t even question it!) is that while the INDIVIDUAL sound TH is produced by placing one’s tongue between the teeth, this sounds acts differently when you speak! When you pronounce words and sentences, sounds don’t act the same, and the TH sound changes a little bit and you don’t have to place the tongue between the teeth anymore but instead the tip of your tongue touches your top teeth. And this approach of focusing on INDIVIDUAL sounds when teaching pronunciation to foreign students is one of the biggest pitfalls in the industry – and again, nobody talks about it because it’s something that’s been accepted for decades…. and thanks a lot for elaborating! As I said, I may have gotten the TH just right because I always felt a bit uncomfortable to put my tongue between my teeth and that’s why I always tended to place the tip of my tongue behind my top teeth so that my tongue touches my top teeth. That’s why my pronunciation may have been quite correct and natural and I also thought so, but because almost every English teaching professional advised that the tongue should be between the teeth, I started to think that I didn’t pronounce it correctly. Now everything starts to be clear for me and I originally understood your video right, but it was still a bit confusing. I think this is just one of those things when you are told many times that something should be done exactly this way and that’s why it’s a bit hard to believe when you are told the otherwise. English teachers are also very proud of the teaching of the individual TH and it is almost like the jewel in the crown in the English teaching industry and that’s why it’s easy to think that of course the TH has to be taught correctly by English teachers. Yes, I agree it’s not that easy to believe all those English teachers have been teaching it wrong, but as the saying goes – “you’ve gotta see it to believe it” – and I guess you’ve seen it yourself when you realized that placing the tip of your tongue behind your upper teeth makes a big difference!